It’s January here in Ashburn, and the entire East coast of the United States was just treated with its first proper snowstorm of the year. Although the snow may be lying thick in roads and on lawns right now, it’s likely that just a day or two of warmer weather will erase it all…until the next time! You may think that all this snowfall means that tree care and maintenance experts like the team at Growing Earth are in full hibernation mode, but that couldn’t be further from the truth! Winter is an excellent time for tree care and maintenance, provided it’s safe to work around the trees and you know what you’re doing. That last one is a big IF. Keep reading to learn more about trimming and pruning trees in winter, and how to avoid mistakes that could harm your trees and end up costing you more in the long run. Then, be sure to contact the tree care and maintenance pros at Growing Earth for a FREE tree trimming or pruning estimate! Why Is Winter The Ideal Time To Prune? Many tree service experts agree that winter is the ideal time to prune and trim your mature trees. Why? Because in the winter time, most trees are dormant, meaning they’re not actively growing and typically have no leaves. The lack of foliage makes it easier to see full branches so it’s easier to make beneficial cuts. Topping – Let’s say you’ve got a tree that’s way too tall or it’s crowding against your house and you want to do something about it. Many people will simply grab their hand saw and hack away at the offensive branches, reducing them to a height they like better. Unfortunately this practice, known as topping, is traumatic for your tree. Topping immediately makes a tree weaker and sends it into shock. Sensing that it’s been dramatically injured, the tree will go into regrowth mode to try to replace the lost branches, resulting in a lot of bushy, immature growth. Topping is very expensive to fix, so unless you want to fork out a lot of cash to tree care and maintenance experts, it’s best to leave drastic trimming to the pros. Stub Cuts – Did you know branches have collars? If not, then you should probably stay away from DIY tree trimming. Not pruning all the way back to the branch collar (which is to say almost all the way back to the trunk) is essentially a botched amputation of a tree’s limb (we call it a stub cut), and it will never heal properly without professional intervention. Flush Cuts – Even worse than not pruning all the way up to the tree’s collar is trimming too far beyond it. Removing the tree’s branch collar is called a flush cut, and it removes the tree’s natural ability to protect and heal itself. Ripping Bark – Let’s say you know exactly where to make a cut, but your saw or pruning clippers aren’t that sharp, or they don’t reach all the way up to the branch in question. Lack of the right equipment may lead you to make improper cuts into heavy branches, which then fall and rip the tree’s bark. Ripping a tree’s bark is just like cutting open its skin, and leaves the tree susceptible to fungus, pests, and other damage. Not Calling The Pros – As we’re sure you can tell by now, the biggest mistake you can make in tree care and maintenance is not calling a professional. 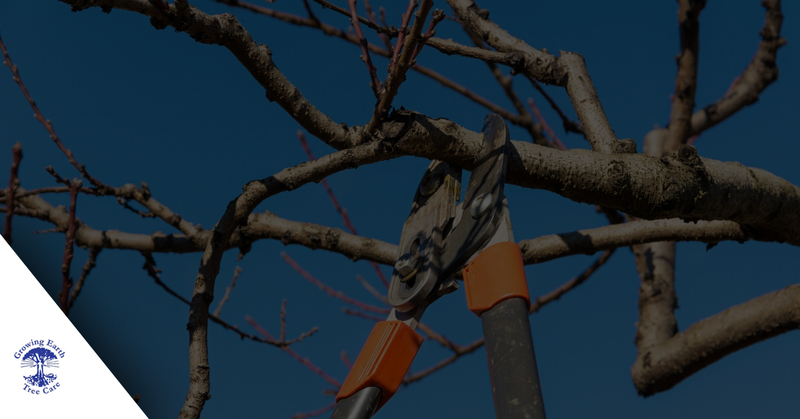 Without the knowledge, skills, and equipment that come along with over 40 years of tree trimming and pruning in Ashburn, it’s likely that you’ll do more harm than good if you attempt to do any serious maintenance on your own. Not to worry! Growing Earth was founded by certified arborists because we hate to see mature trees get sick or even die because someone makes a serious pruning mistake. Contact us today for a FREE estimate on your tree maintenance service. We’ll come out to your property, inspect your trees, and recommend only the services you need and nothing you don’t.